Every family brings unique gifts...and challenges! 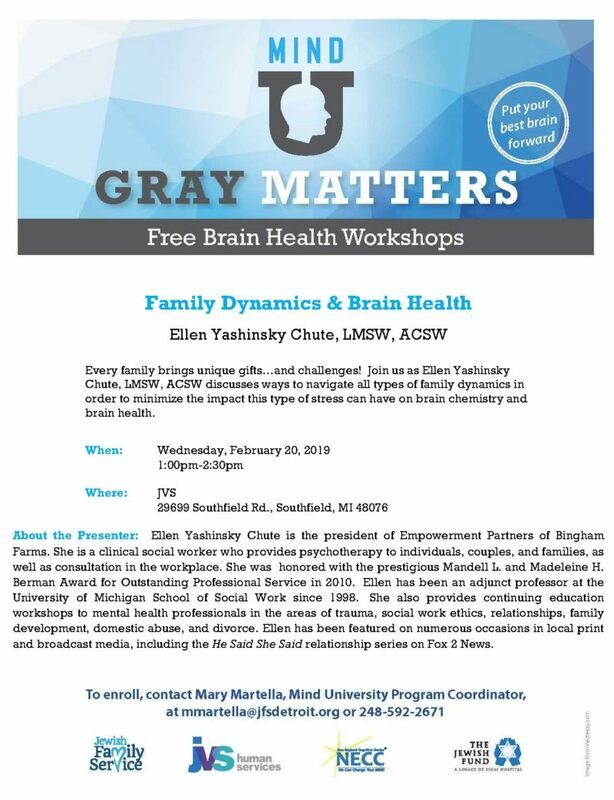 Join us as Ellen Yashinsky Chute, LMSW, ACSW, discusses ways to navigate all types of family dynamics in order to minimize the impact this type of stress can have on brain chemistry and brain health. Ellen Yashinsky Chute is a clinical social worker and president of Empowerment Partners of Bingham Farms. An adjunct professor at the University of Michigan School of Social Work since 1998, she also provides continuing education workshops to mental health professionals in the areas of trauma, social work ethics, relationships, family development, domestic abuse and divorce.